Representatives of CryptoB2B, MatrixBank, ICOrating and Imigize took part in ICO-Hypethon 2017. Of all the events of the conference, it is especially possible to single out a personal acquaintance with the co-owner of Bancor, Eyal Herzog, in the center of the photo. Bancor – https://www.bancor.network. Crowdsdale-ICO Bancor brought the owners $ 150 million in 3 hours. Eyal kindly agreed to analyze the concept of ICO for Imigize and make personal criticism. In the near future, the Imigize team will prepare a preliminary concept for an exit to the ICO. The CryptoB2B founder is also one of the founders of the Imigize project – a technology for contactless shoe fitting using a mobile phone or a stationary scanner that can be used in shoe stores online. 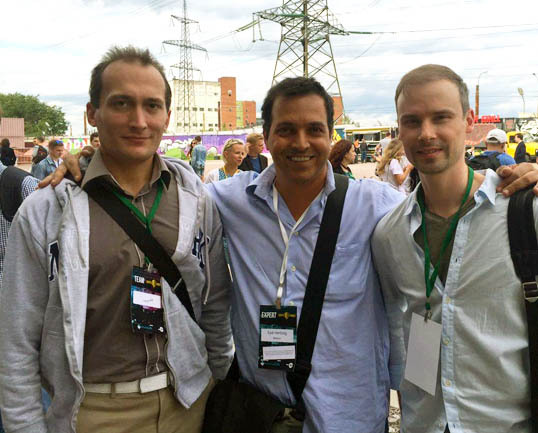 In the photo from left to right: Borodin D. (CryptoB2B), Eyal Herzog (Bancor), Chernik M. (Imigize).